Insel Mühle is ideally located at the small river Würm in the western area of Munich city. Insel Mühle means Island Mill, as the location was once a functioning water mill. Large, dense chestnut trees shade 800 seats in the self-serviced area. Some of the tables are standing right next to the water stream where fish and ducks can be seen swimming by. The restaurant and the serviced area is by the original mill building across the small river connected by a foot bridge. 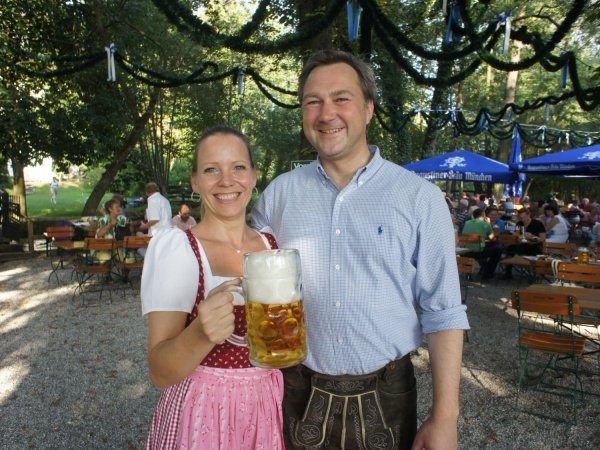 In the self-serviced beer garden area, the Augustiner Hell (lager) costs €6.90 p/Maß (April 2013). During weekdays until 5pm the "Biergartensensation" (happy hour) offers a Maß and half a Hendl (grilled chicken) at a special price. The beer garden is open from April until October on Monday to Thursday from 4pm until 11pm and Friday to Sunday from 11am until 11pm.